Wyberton have been crowned Challenge Cup champions. They completed their first season back in the Lincolnshire League by lifting silverware, courtesy of a 3-1 victory against Ruston Sports last Wednesday evening. Curtis Revell put Wyberton ahead when he went through one-on-one and calmy chipped the keeper at Lincoln United’s Ashby Avenue ground after 10 minutes. Wyberton’s lead was doubled on the 20 minute mark as Grant Butler hit a thunderous 30-yard screamer into the top corner. Rustons pulled themselves back into the game from the penalty spot five minutes before the break when Scott Dawson was adjudged to have handled in the box. 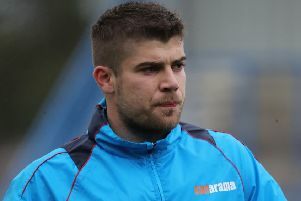 However, Gary Frost’s side began the second half the brighter and Butler turned provider, Ben Jaques connected with his long throw to head home the third. Rustons piled on the pressure late on, but Wyberton defended valiantly and Revell hit the cross bar in the final minutes.